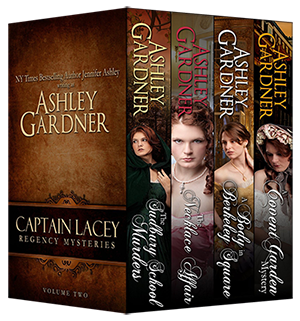 A collection of Books 4-6 in the Captain Lacey Regency Mysteries series plus an original novella, The Necklace Affair. Captain Gabriel Lacey, a half-pay cavalry officer who returns to Regency London after being injured in the Peninsular War, has found some purpose investigating crime. Along with his friend, Lucius Grenville, a dandy who’s one of the wealthiest men in England, Lacey delves into the dark world behind the glittering Regency ballrooms. He’s solved murders and robberies, has assisted Bow Street and the Thames River Police, and has been pulled into the schemes of a powerful crime lord. In this collection, Captain Lacey takes a post in a boys’ school as well as hunts criminals from Mayfair mansions to the back streets of Covent Garden. In The Sudbury School Murders, a corpse in a Berkshire canal leads Captain Lacey on a twisted trail of blackmail and corruption in a school for boys of England’s wealthiest families. In The Necklace Affair, Captain Lacey comes upon a distressed lady at one of Grenville’s soirees, whose innocent maid has been arrested for theft. Lacey hunts for the true thief of the diamond necklace and becomes entangled in a mesh of dark secrets. In A Body in Berkeley Square, Lacey is called in to solve a murder at a grand society ball. The accused? His mentor and former friend, Colonel Brandon. Colonel Brandon is certainly acting guilty, and only Lacey is willing to prove him innocent. A Covent Garden Mystery plunges Lacey into a case that hits close to home—girls are going missing in Covent Garden, and one happens to be his daughter. Join Captain Lacey and his friends as he further investigates intrigue, murder, and villainy.